Here is an issue of considerable historical interest and exceptional rarity value. It enshrines performances made in Stockholm in 1899. They were made by the American William Sinkler Darby for Emile Berliner’s eponymous pioneering record label, using what was, even then, Berliner’s oldest and least advanced recording technique. The whole recording apparatus, which Darby had hawked around Europe, weighed half a ton. The repertoire that Darby selected, or that which was suggested to him, was scatter-shot. There were some classical singers but also music hall personalities and monologuists and the like, some amateur, others professional. 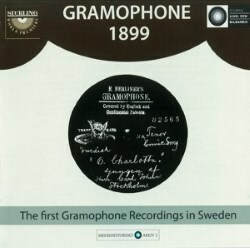 Interestingly when they returned to Sweden in 1903 they had the foresight to record John Forsell with Wilhelm Stenhammar as his piano accompanist, amongst other luminaries, though the repertoire and the performers remained a very mixed bunch indeed. So, this twofer gives a representative sample of the musical and verbal entertainment to be encountered on recital stage and music hall as the new century dawned. The recordings are inevitably only able to provide a simulacrum of the clearly enviable brio and theatrical nous that these performers possessed, but in a number of cases their vitality comes through very well. Of the performers, Carl Johnn was what’s described as an ‘enthusiastic amateur’ but young Henning Malm had just made his local debut at the Royal Opera. Oscar Bergström possessed a warm baritone, as the world was to discover when he made a slew of discs years later for international labels. One finds here light songs – wonkily recorded pianos to the fore in accompaniment – vocal duets on traditional or other themes, unaccompanied folkloric melodies, recitation and monologues, personality performers, Music Hall stars, popular vocal quartets, and the very occasional example of contemporary opera. Verdi, of course, was still alive when Birger Schücker sang his two-minute extract from La Traviata - though Gustaf Sjöberg fares very much worse in his Magic Flute extract; he’s hollow and unstylish. In the main, however, light music and music hall predominate. Collectors of Swedish monologues – I know you’re out there – will have a field day with these earliest examples of the recorded spoken word in Stockholm. Indeed, the transfers have coped manfully with numerous problems inherent in the restoration and playback of these Berliners. That work was carried out at EMI’s studios in Hayes. This is inevitably a very specialised market but when things are done as well as this, credit should be paid. The booklet is excellent. There are no texts – it would have taken a fair-sized book to contain all the texts – and nor are there summaries of the songs or monologues. The majority of the booklet text is in Swedish but there’s a three-page English summary. Importantly, full discographical information is given.